In Mediterranean regions, climate change increasingly affect tree species distributions. 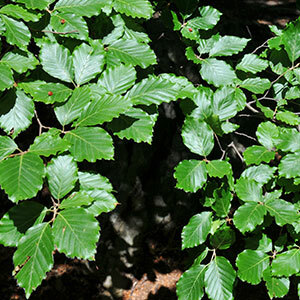 Conifer forests under continuing disturbance show a more rapid shift to dominance by beech and other temperate broadleaves. Thus, there is an urgent need to conserve coniferous vegetation to avoid local extinction. Gap opening has profound effects on the structure and dynamics of most forests and may represent a sustainable way to restore coniferous ecosystems in Mediterranean habitats. What kind of artificial canopy opening is the most sustainable and effective means for restoring coniferous ecosystem functions? We explored the efficacy of artificial gaps in regeneration and dynamics of coniferous in Mediterranean environment. We examined how regeneration of different tree species is associated with soil environmental conditions and how gaps of different sizes influence the ecology and management of Mediterranean forest. Specifically, we analyzed gap disturbance in silver fir and black pine stands, as they dominate central and southern Italian forests. We demonstrated a specificity between gap size and coniferous species regeneration, indicating that small gaps (about 200 m2) favor silver fir regeneration, while black pine, depending on its subspecies, regenerates both in small and medium gaps (about 500 m2). Further, we found that gap characteristics (age and shape) and suitable substrate availability are the primary factors affecting seedling establishment. Our results provide functional information to design a silvicultural system useful to manage the natural regeneration of Mediterranean forest minimizing the environmental and visual impact. Microenvironmental variability and species-diversity in treefall gaps in a subtropical broadleaved forest. Vegetatio 103: 31-40. Structure and dynamics of a beech forest in a fully protected area in the northern Apennines (Sasso Fratino, Italy). iForest 4: 136-144. Stand dynamics and natural regeneration in silver fir (Abies alba Mill.) plantations after traditional rotation age. iForest 7: 313-323. Spatial and temporal patterns in structure, regeneration, and mortality of an old-growth ponderosa pine forest in the Colorado Front Range. Forest Ecology and Management 219: 43-55. Quantifying edge effect and patch size for multiple-use silviculture: a discussion paper. Forest Ecology and Management 48: 249-264. Treefalls, regrowth and community structure in tropical forests. In: “The Ecology of Natural Disturbance and Patch Dynamics” (Pickett SA, White DC eds). Academic Press, Inc, Orlando, USA, pp. 53-69. The restorative imperative: challenges, objectives and approaches to restoring naturalness in forests. Silva Fennica 45: 843-863. Interactions between climate change, competition, dispersal, and disturbances in a tree migration model. Theoretical Ecology 1: 209-220. Spatial and temporal patterns of ground vegetation dominants in mountain spruce forests damaged by sulphur air pollution (Giant mountains, Czech Republic). Boreal Environment Research 20: 620-636. Variation in canopy gap formation among developmental stages of northern hardwood stands. Canadian Journal of Forest Research 26: 1875-92. Principles of silviculture. McGraw-Hill, New York, USA pp. 452. Gap partitioning among tropical rainforest trees. Biotropica 12: 47-55. Climatic limits for the present distribution of beech (Fagus L.) species in the world. Journal of Biogeography 33: 1804-1819. Afforestation improves soil fertility in south-eastern Spain. European Journal of Forest Research 129: 707-717. Characteristics of gaps and natural regeneration in mature longleaf pine flatwoods ecosystems. Forest Ecology and Management 187: 373-80. Ecology of butterflies in natural and selectively logged forests of northern Borneo: the importance of habitat heterogeneity. Journal of Applied Ecology 40: 150-162. Canopy gap characteristics and tree replacement in the southeastern boreal forest. Ecology 79: 783-794. Patterns of gap-phase replacement in a subalpine old-growth forest. Ecology 73: 657-669. Variations in soil chemical properties and microbial biomass in artificial gaps in silver fir stands. European Journal of Forest Research 126: 59-65. Influence of gap size on organic matter decomposition, microbial biomass and nutrient cycle in Calabrian pine (Pinus laricio Poiret) stands. Forest Ecology and Management 242: 412-418. Gap size effects on above- and below-ground processes in a silver fir stand. European Journal of Forest Research 129: 355-365. Effects of gap size and soil chemical properties on the natural regeneration in black pine (Pinus nigra Arn.) stands. Tree and Forestry Science and Biotechnology 5: 65-71. Silviculture. Concepts and applications. McGraw Hill, Boston, USA, pp. 682. Structure and tree-fall gap dynamics of old-growth Nothofagus forests in Tierra del Fuego, Argentina. Journal of Vegetation Science 4: 641-654. The role of tree-fall gaps in the natural regeneration of birch forests in the Taibai Mountains. Applied Vegetation Science 18: 64-74. Management of Austrian black pine on marly lands for sustainable protection against erosion (Southern Alps, France). New Forests 31: 535-543. Patterns of disturbance in some old-growth mesic forests of Eastern North-America. Ecology 63: 1533-1546. Canopy tree turnover in old-growth mesic forests of eastern North America. Ecology 8: 554-567. Species diversity and regeneration of old-growth seasonally dry Shorea robusta forests following gap formation. Journal of Forest Research 20: 7-14. Methods for studying treefall gaps: a review. Forest Ecology and Management 261: 1143-1151. Treefall gaps and the maintenance of species diversity in a tropical forest. Ecology 82: 913-919. Treefall gaps and the maintenance of plant species diversity in tropical forests. In: “Tropical Forest Community Ecology” (Carson VP, Schnitzer SA eds). Blackwell Publishing, Oxford, UK, pp. 196-209. The practice of silviculture: applied forest ecology. John Wiley and Sons, New York, USA, pp. 537. Forest development in canopy gaps in old-growth beech (Nothofagus) forests. New Zealand Journal of Vegetation Science 2: 679-690. Pinus nigra subsp. salzmannii forests from Southeast Spain: using structure and process information to guide management. In: “Pine Forests: Types, Threats and Management” (Frisiras CT ed). Nova Science Publishers Inc., New York, USA, pp. 279-314. Effect of gap size on seedling establishment, growth and survival at three years in mountain ash (Eucalyptus regnans F. Muell.) forest in Victoria, Australia. Forest Ecology and Management 117: 33-42. Dynamika vývoje pralesovitých rezervací v CR II - Lužní lesy (Cahnov-Soutok, Ranšpurk, Jirina) [Developmental dynamics of virgin forest reserves in the Czech Republic II - The lowland floodplain forests]. Academia, Praha, Czech Republic, pp. 216. Gap regeneration in primary evergreen broadleaved forests with or without a major canopy tree, Distylium racemosum, southwestern Japan: a comparative analysis. Ecological Research 9: 295-302. Gap characteristics and gap regeneration in subalpine old-growth coniferous forest, central Japan. Ecological Research 10: 31-39. Edge effects in mixed conifer group selection openings: tree height response to resource gradients. Forest Ecology and Management 179: 107-121.